Three short plays unified by obscure, tortured genius and a bucket of water. 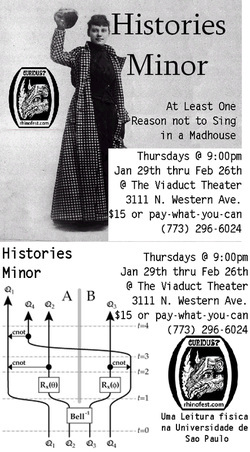 ‘An Interminable Number of Nights in a Madhouse‘ shows feminist icon and muckraking journalist Nelly Bly battling her own sanity. ‘Uma Letura Fisica Na Universidade de Sao Paulo’ follows the career of disgraced quantum physicist David Bohm. ‘Barnard Battles The Chicago Fire’ chronicles the fate of pioneering Civil War photographer George Barnard.